Super Hero Boy: That crazy Cruella is back again. That crazy Cruella is back again. Cruella is on the loose again, released from jail, "reformed" and now an avid dog lover. Who on earth would believe such a thing... I mean really if your crazy enough to want a dalmatian skin coat I'm not sure there is such a thing as reform. Cruella is not even remotely reformed and it doesn't take long until she is back to her old tricks and back on the trail of making her dreaded puppy jacket. The only problem is 102 Dalmatians just lacks the story of the first rendition. It reminds me way too much of the home alone series where it was just the same story with a new set of weird twists and an ever growing wacky cast. In this case its a bunch of misfit dogs, a parrot with a British accent, and a puppy named Oddball which is by far the best character in the movie. There’s even more outrageous fun for the dog lover in everyone when 102 Dalmatians comes to DVD for the first time in four years on September 16, 2008 from Walt Disney Studios Home Entertainment. The hilarious adventure stars the audacious Oddball, an all white Dalmatian puppy in search of her rightful spots, and Waddlesworth (voiced by Eric Idle), a wisecracking macaw who thinks he’s a Rottweiler. From the streets of London to a posh Parisian bakery, this barking mad duo leads a posse of puppies on a mission to outfox unrepentant fur felon Cruella De Vil. Filled with chases, close calls, hilarious antics and thrilling escapes, this adventure-packed tale is a wacky good time that will have the entire family howling with laughter. 102 Dalmatians is available on Amazon right now! I have two copies of 102 Dalmatians available to give away to my readers! Leave a comment on this post. 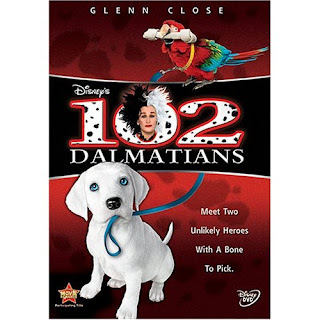 Check out 102 Dalmatians and tell me who you'd watch this with if you won! I'd watch this movie with my daughter if I won. I'd watch it with my husband and invite some friends over also. It would be a fun night. I'd watch this with my youngest nephew if I won. my niece would be the first person I'd have to watch this with! I would watch this with my 1 year old grandson, Noah. Thank you so much for this giveaway. We'd watch this movie with our kids. We try to have a "family night" two times each week, where we watch movies or play a game together. We'd watch this all together as a family. I would watch this with my husband, my three-year-old, my almost two-year-old, and my almost seven month old. I would watch this with all three of my kids. It would be great for our Friday night movie night. I'd watch it with my son. I would watch this with my daughter if I won it. I gotta have this for my daughter. Nothing she loves more than puppies! She threw a birthday party today for her favorite pup pup. Thanks for the chance! babysmamatimes3[at]yahoo[dot]com. I'd watch this with my little girl. I love Waddlesworth!!! My husband has never seen this movie but he really wants to after I kept going on and on about the "talking bird" lol! I would totally watch this with my son!!! Thanks. My grandsons would love this movie. We watch 101 Dalmations both animated and with Glenn Close all the time. This would make for a great popcorn snuggling movie night with them!! Thanks for the chance to win. I'd watch this one with my grandchildren. I would watch with my daughter. Thanks! Rylee likes to watch anything with dogs or cats. I would love to watch it with her. I will watch this with my grandchildren. Thank you! My daughter is nuts for any movie with live animals. This would be a great one. Thanks for the great contest! I would watch this with my 2 kiddos if I won. I'd love to win this. I'm a Disney fanatic and would probably watch it alone. I would love to sit down and watch this with my daughter and my son. My little boy just LOVES "dog-dogs"! My family will love to watch this! I would watch it with my 6 year old brother and 4 year old sister! I would watch movie with my kids and husband. I know I would love to watch this with my daughter. She loves Disney movies, and so do I! I'd watch this with my neice who loves dogs. I love 102 Dalmatians, I would watch it with my little sister and our little pug. Some of my grandkids. I have 14 to choose from. I'd get a great big bowl of buttered popcorn and snuggle up with Liz and Tristan to watch this DVD. You can't go wrong with a Disney film. I'd watch with my granddaughter...thanks! We would watch this as a family. I would watch this with my son & daughter. It would be a perfect Christmas gift to them. I'm no blogger but I'll give it a shot. Of course, I'd watch this with my 4 year old wha has already seen it AND LOVED it at the theatre! My 8 year old son and 5 year old grandson. Thank you for having this! I would love to win to watch with my 3 little ones. Thank you! I'd watch it with my family. I would watch this with my boyfriend! I still subscribe to your feed. I love it. I would probably watch this with my yougner cousins, who love it! I'd watch it with my son! He'd love it! no one to watch it with... alone in life. Find me a wife please. I would watch it with wife and kids. I'd watch with my hubby and kids. Definitely my daughter. She loves Disney movies! I would watch this with my 6 and 8 year old boys. They would enjoy it! I would watch this with my grandkids...thanks for the great giveaway. I would so watch this with my 3 and 6 year old little boys! Thanks for the chance to win such a great gift! Son, daughter, and wife too. I would watch this with my nephews! I would watch this with my niece. She loves the dalmation movies. I'd watch this with my husband and our dogs! I would love to watch this with my daughter...she loves to bark when she sees puppies. I would watch this with my son and daughter. I would watch this with my two sons and husband. Thanks for the fun giveaway! I'd watch this with my husband and 2 little ones. It looks like a fun one to watch! Of course my cutie pie grandaughter shayna. I'd watch this with my awesome kids! I would play this for all the kiddos while I teach the new OB class at our clinic! We just got a TV in there and that would be great. I'd watch this with my four young'uns. I would definitely watch this with my wife and kids. This would definitely be something my daughter and I would watch. I would definitely watch this with my sister. Don't ask how old we are - LOL. When we were teenagers, we'd find a friend with a little brother or sister to go see Disney movies with so people would think we were being nice and going just to take the little kid. I would watch this with my 3 year old. I'd watch this with my husband and little boy. I would love to watch this with all of my kids, but I know my ten year old daughter would LOVE it, because she is crazy about dogs! Thanks! We would watch it with the whole family, my 3 kids, husband and myself. Thanks for this great giveaway! I have three kids who would love to watch this show! I would watch this movie with both my daughters. Our whole family would watch it together. We love movies on the weekends. I would watch this with my niece and nephew, for sure, and they'd love it! I would watch this with our family! We loved the first movie! I am a subscriber, too! I'd love to win this and watch it with my daughter! I would watch this with my baby and step daughters. I would watch this with my three little boys! I would watch this with my 3 sons. I would watch this movie with my grand children if I won. I'd watch with my nieces, they'd be thrilled! I would watch this great movie with my niece and probably every single child that comes over. I would watch this with my daughter and 2 grandchildren on movie night. This would be so great. Thank you! I'd watch this with my sons! Thanks for the great contest. I'd give this to my children. I'll watch this family film with the whole family. Please accept my entry. Thank you. Would watch it with hubby and my little gir. Thanks for the contest, have a great weekend everyone. I would be most likely to watch it alone! I would so enjoy watching this movie with my daughter. she would love it !! Just one dalmation is too many. They leave you seeing spots. I will watch this with my brand new coat! I'd watch it with my grandsons. I'd watch this with the baby i'm expecting when I have it, the baby's dad and his son, one happy family haha. I would watch with my grand-daughter and with great grandchildren when they come to visit at Christmastime. I'd watch this with my son. I'd watch is with my son. Pongo and Perdy is his favorite! I'd watch this with all 4 of my kids, 2 boys, 2 girls, ages 13 all the way down to 3. I would watch with my little grandson. I know he'd love it. I would watch it with my nephew. I'd love to watch this with my daughter! my granddaughter, enter me please. My little girl, of course! Watching this with grandchildren would make my day,I would love it and so would they. I would watch this with my 4 grandchildren! Thanks for the giveaway! I would watch this with my two kids! I would watch this with my grandson. He has an incredibly wacky sense of humor and I know he would love it. This would be a family movie to watch on pizza/movie night. I'd watch it with my granddaughter.